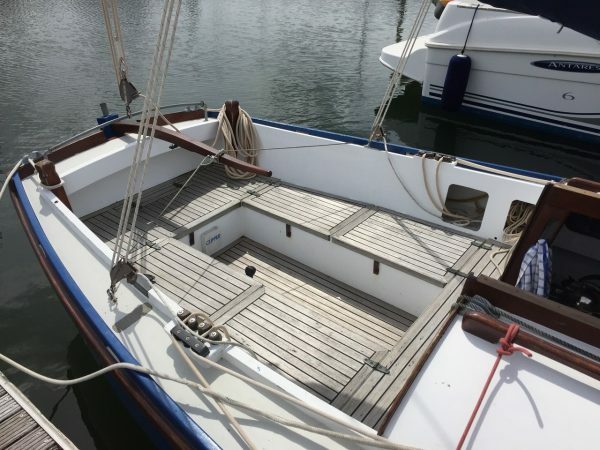 Golant Gaff Cutter for sale. 2 berths, heads, galley. 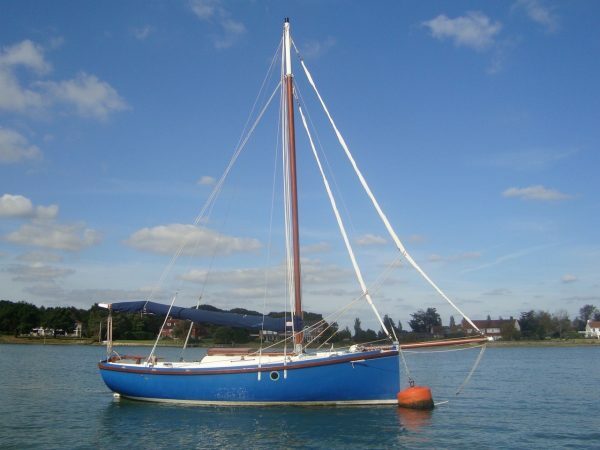 The Golant Gaffer, designed by Roger Dongray, is a modern take on the traditional working boat. Designed to be built by the enthusiastic amateur, she is a capable and pretty yacht, easily handled and by all accounts a joy to own. The design has a 45% ballast ratio and good hull form stability so she stands up to her canvas and has very satisfactory performance. 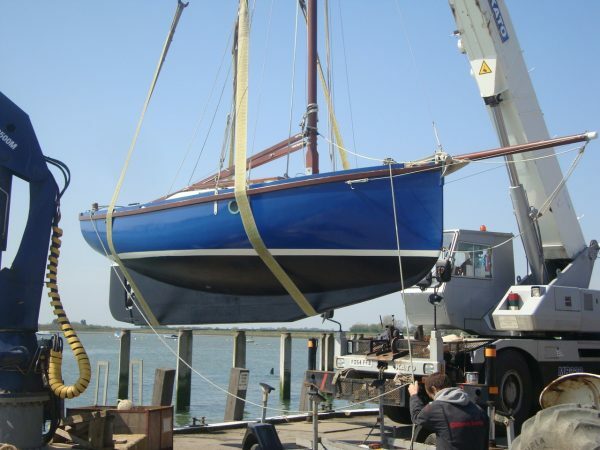 This particular boat was built in 2002 by a Mr John Smith of Suffolk who owned the boat for 8 years before selling her to the present owner. 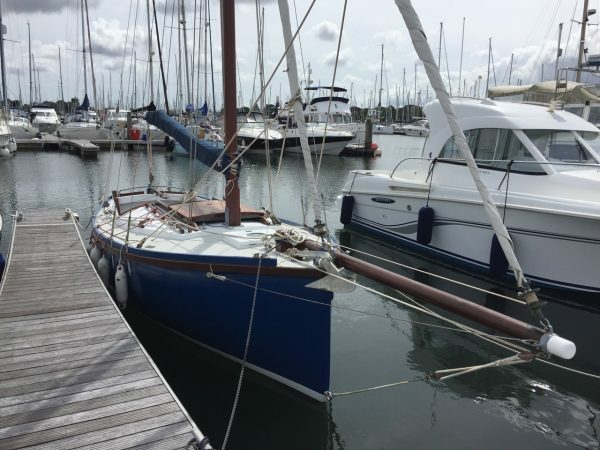 The build was supervised by a local surveyor and a survey report from just before her launch states the “quality of workmanship and materials used are commensurate to a professional standard…” The present owner has taken good care of her and has been cruising mainly around the Solent and local coastline. 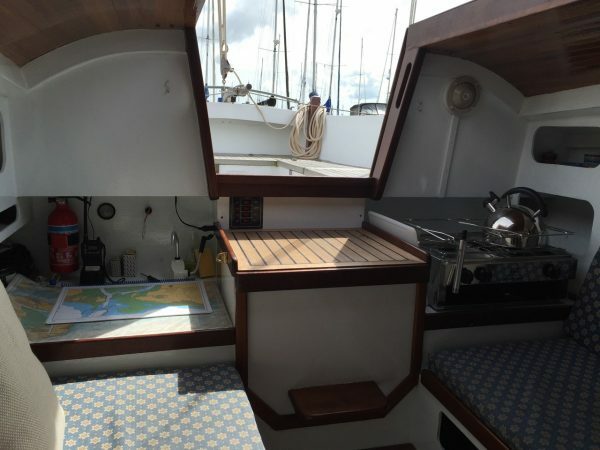 For many this is the ideal type of yacht as she has a good size cockpit for lazy summer days, a head and galley for a little comfort during the afternoon sail and importantly can be towed behind a vehicle on her custom road trailer which is a way of dramatically reducing the annual running costs of your boating. 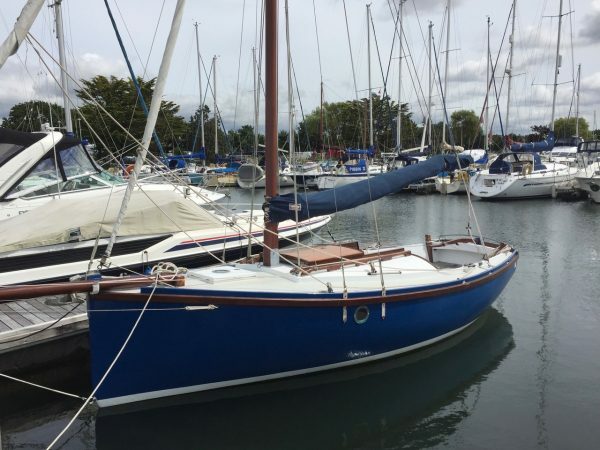 A fine little yacht in very nice condition and complete with trailer ready to sail. 2002 survey report available. Strip plank Alaskan Cedar hull, all epoxy glued and sheathed externally with epoxy glass cloth. Widely spaced sawn Iroko frames with bronze screws. 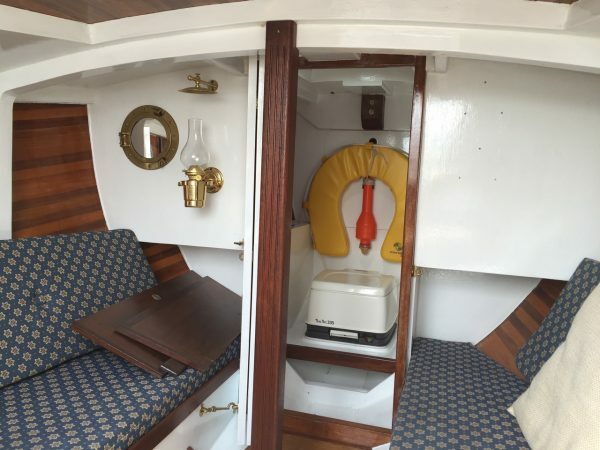 Large cockpit with scrubbed teak thwarts. High peak gaff cutter rig on a deck stepped wooden mast. Wooden boom, gaff yard and bowsprit. All lines lead to the cockpit so she is safe and easy to handle. Stainless steel standing rigging to external chain plates, 2002. 265sqft of sail with main, staysail and jib. All in good condition. Yanmar 1GM10 mounted on the centreline. New water pump and cutlass bearing 2014. Flexible water tank in the saloon. 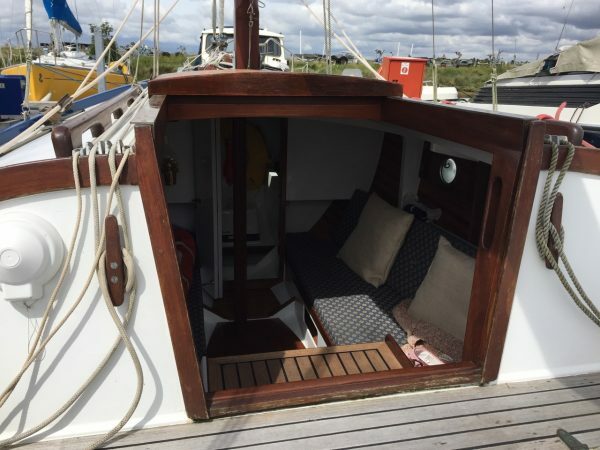 2 berths with sitting headroom. Steps down in over the engine box. Folding door into the forepeak with a chemical toilet and storage.